Today is the Memorial Day holiday here in the U.S. It’s a holiday set aside for the remembrance of the men and women who sacrificed their lives in service of our country. We are blessed to live in a country with unprecedented freedom. We are free to write and speak our mind. We are free to marry the one we love, have children, and raise them the way we think best. We are free to worship God any way we choose. We are free to select our own local and national leaders. We are free to pursue our dreams even when they seem impossible, crazy, or stupid to everyone else. I thank God for these freedoms. I’m grateful for all who have sacrificed their lives going all the way back to the War of Independence all the way up through the war against terrorism going on in Afghanistan today. My heartfelt gratitude and sympathy to all of you who have lost love ones fighting for freedom. This post an open forum for everyone to post their thoughts related to Memorial Day. If you’ve lost a love one in service, write a note about him or her in the comments. If you want to express your gratitude and sympathy to those who have lost love ones, please do. 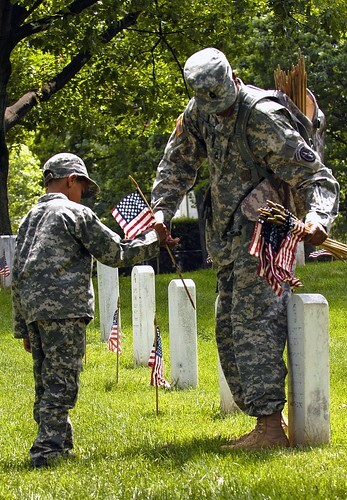 If you have a favorite story or quote about freedom or sacrifice that’s meaningful for you, please share it.